This world map shows which side of the traffic is. 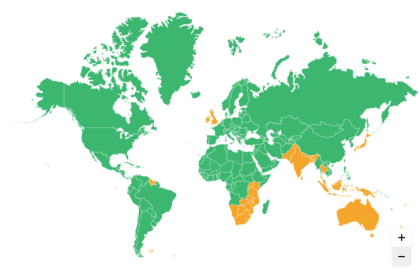 The people in green countries drive on the right and the people in orange countries left. As you can see, with some exceptions, most of the former British colonies drive on the left, while the United States of America, Latin American countries and European countries drive on the right. Almost always, in a country whose drivers drive on the right, the manufacture of the car makes the drivers sit on the left side of the car. On the contrary, driving on the left usually means that the drivers` seat is on the right side of the car. This can be said to be the most important thing to pay attention to when driving from a country of driving on the right to China. Driving on the right, almost every car runs on the left, and the driver sits on the right side of the vehicle. In China, and even in many other countries, drivers sit on the left and traffic lanes are on the right. A car coming from the opposite direction will be on your left. Turning left means you need to cross the oncoming traffic. Traffic signs will be on the other side of the road – in right-driving countries, most of them will be on the left side of the road. in China, the traffic signs are all on the right side of the road. The roundabout moves in the opposite direction, but generally speaking, the roundabout will flow counterclockwise. Besides,you should also know the driving rules of China. As you may already know, on a multi-lane road in a right-driving country, the left lane (the vehicles farthest from the center or the oncoming vehicles) is slower. Faster traffic will be closer to the interior lane of oncoming traffic. When you drive in China, the rule is opposite that the slower traffic is on the right, and the faster traffic is closer to the middle or the oncoming traffic. Therefore, driving in China, you should try to keep driving on the right side unless you want to overtake. The left side of the road is passing lane. Besides driving in the right lane, it’s also a good idea to observe your driving position. Thinking about it this way: when driving in right-driving a country, drivers usually align the edge of the vehicle with the edge of the lane to ensure that the vehicle is in the right lane. You may not think so, but turning on the other side of the road is one of the most challenging things. When you need to turn left, you need to turn in the nearest lane to the middle of the road or the nearest lane to the oncoming vehicle. As for turning right, you need to make sure that you are in the right lane (closest to the edge of the road) and turn to the other nearest lane to the roadside. Generally speaking, driving in China and other countries, it is easier for a car with the driver’s seat on the right to park, because you can see the kerb better from the right side of the vehicle. The problem is that you need to cross the lane to get to the parking space. Because you will turn left, and you should not only watch the oncoming traffic , but also pay attention to the traffic behind you. Finally, if you plan to drive in China, you need to make sure that your license and insurance are valid there.